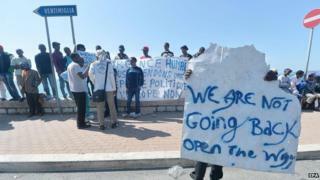 About 200 migrants, mostly Africans, are having to sleep rough at Ventimiglia on the France-Italy border as French police refuse to let them in. The migrants are just a short distance from up-market French Riviera resorts. Some have gone on hunger strike. They were stopped on the border last week, and began a sit-in, some of them camping out at the railway station. France says it is up to Italy to house them and assess their asylum claims, as they arrived in Italy by boat. The Mediterranean migration crisis has put a huge strain on Italian, Greek and Maltese resources. Most of the Ventimiglia group are from Sudan, Libya and Eritrea. Italy is struggling to cope with boatloads of migrants arriving in unprecedented numbers from Libya. People-smuggling gangs have taken advantage of Libya's war and chaos to run a lucrative racket sending packed, unseaworthy boats to Europe. EU interior ministers are to discuss the crisis in Luxembourg on Tuesday. Italy and the other "frontline" Mediterranean countries are urging their EU partners to share the burden of handling asylum claims. France and Italy are part of the EU's Schengen zone, where border controls are minimal. But states can tighten border checks in exceptional circumstances, for example to deal with an unexpected migrant influx.